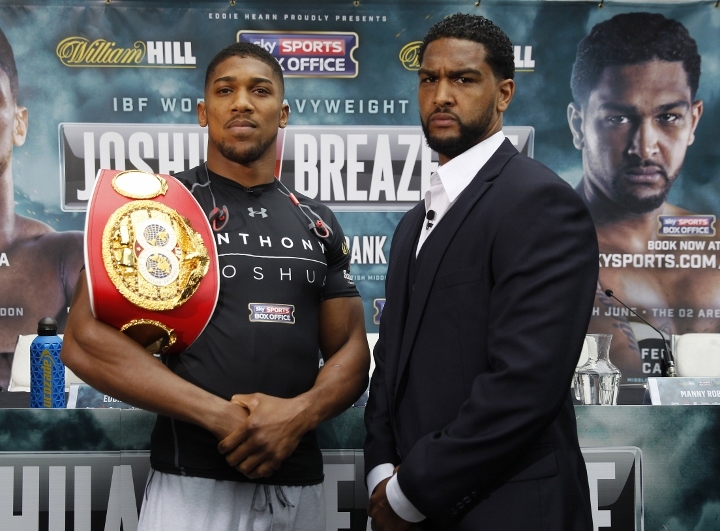 NEW YORK – Dominic Breazeale knows all too well about the problems Anthony Joshua presents. The unbeaten British superstar dealt Breazeale the only loss of his professional boxing career in June 2016. The 2012 Olympic gold medalist established a sizeable lead, dropped Breazeale twice and stopped him in the seventh round of their scheduled 12-round bout at O2 Arena in London. Breazeale rebuilt himself by knocking out then-unbeaten Izu Ugonoh, Eric Molina and Carlos Negron. Along the way, Breazeale became the mandatory challenger for Deontay Wilder’s WBC heavyweight title, at which the former college football quarterback will get a shot May 18 at Barclays Center in Brooklyn (Showtime). The WBC’s decision to make Breazeale its mandatory heavyweight championship challenger over Dillian Whyte was inexplicable because Whyte was rated higher. That baffling process notwithstanding, Breazeale is eager to prove that he is a different fighter than the unseasoned contender Joshua exposed nearly three years ago. It’ll help his cause, according to Breazeale, that the 6-feet-7, 212-pound Wilder (40-0-1, 39 KOs) isn’t nearly as good as the 6-feet-6, 245-pound Joshua (22-0, 21 KOs). Wilder won a bronze medal at the 2008 Summer Olympics in Beijing. Breazeale took up boxing at 23, once his career as a Division II quarterback for Northern Colorado University ended and a career in professional football didn’t pan out. Breazeale thus learned on the job, but he feels he is more prepared, at 33, to become a heavyweight champion. “The Joshua fight, I learned that there was a bigger, stronger, more athletic man across the ring that night,” Breazeale said. “At the same time, I learned that I had a lot to learn. The loss and the experience of losing opened my eyes to the fact that, yeah, I came from a quarterback, man. I wasn’t supposed to be doing this boxing thing. I started at 23. People still can’t believe that I’m 33 now, I’m fighting for the WBC title. I tell people that idea, they think it’s a joke. But at the same time, you get in the ring with a guy like Joshua, he’s got several belts for a reason and he’s defending them against the right guys. It's funny how people talk about deontay skills but u don't need skills when u have a one hitter quiter.ask Ortiz and Tyson F.
I hope Breazeale doesn't spoil the AJ/wilder party. Hez got a decent right hand as well, thou I dnt trust his defense.